Impressionism began in 1874 when a group of artists organized an exhibition using this title. The original group of now famous artists were Monet, Auguste Renoir, Alfred Sisley and for a short time Paul Cezanne and Camille Pissarro. The title of the exhibition was derisive, just as the term "baroque" was derisive to the art and artists that developed the earlier Baroque style of painting. With the passage of time, some sooner and more than others, this small group became famous artists and painted many famous paintings. As in the beginning of many new periods, and is the case with Impressionism too, the viewing public becomes used to seeing art in a certain way. New challenges to the usual art perceptions are not accepted. The public accepts what it knows is art instead of what it really sees with their eyes. This style of art offered a new scientific way to view the visual world. Instead of rendering solid objects these artists of Impressionism painted light that made up a form. They realized an object does not have its own color, but many individual patches of color. There is no smooth blended transition of color from light to dark. Shadows have only positive color just as those colors in direct light. The water in Monet's famous "Red Boats at Argenteuil", 1875, has many hundreds of separate color strokes. Monet discovered through experiments, as other artists were to later do, that the eye blended these color patches together and formed the whole, and the nature of water. Art of this period attempted to capture in paint the changing effects of momentary light. The paint itself made a statement or an effect separately from the Nature it is rendering. The experiments of these painters at the end of the nineteenth century lead toward the expression of modern abstract art in the twentieth century. The painters of Impressionism in art history were influenced by Delacroix's system of color called "flochetage". In this system Delacroix applied color in individual strokes. He saw color within color. Any color could exist within another color, either by reflection, or because the artist wanted to add color to an existing color field, in order to enhance the field, or to enhance and compliment colors that were nearby. Click on the graphics below to increase graphic sizes. At the same you can also view an opportunity to purchase a poster or painting reproduction. 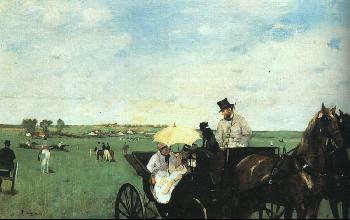 Subscribe with your Reader, to my RSS impressionism Art feed: http://www.